Extract from a statement about Lady Lude who was recorded to have forced her tenants into the rebel army of the Young Pretender, 5 August 1746 (SP 54/33/26D). 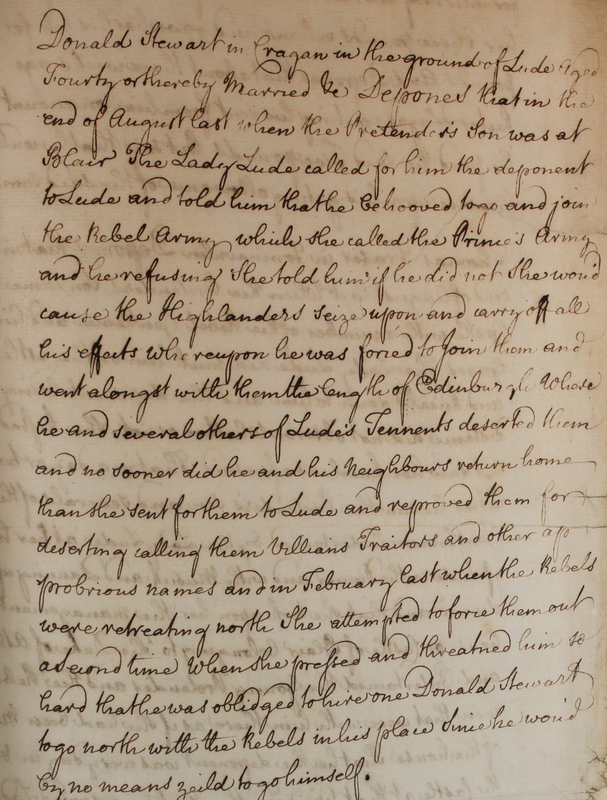 Donald Stewart in Cragan in the ground of Lude aged fourty or thereby married. He Deponed [declared under oath] that in the end of August last when the Pretender’s son was at Blair, The Lady Lude called for him the deponent [witness under oath] to Lude and told him that he behooved [to be necessary] to go and join the Rebel Army which she called the Prince’s Army and he refusing she told him if he did not she would cause the Highlanders seize upon and carry off all his effects [possessions] whereupon he was forced to join them and went alongst with them the length of Edinburgh, where he and several others of Lude’s [tenants] deserted them and no sooner did he and his neighbours return home that she sent for them to Lude and reproved them for deserting calling them villains Traitors and other approbrious [shameful] names and in February last when the Rebels were retreating north she attempted to force them out a second time when she pressed and threatened him so hard that he was obliged to hire one Donald Stewart to go North with the rebels in his place since he would by no means yield to go himself.